After more than two years of grassroots opposition and efforts by folks who live within the “blast zone” of the Union Pacific railroad mainline and coastal communities through which the “bomb trains” laden with toxic and potentially incendiary tar sands will pass en route to the proposed off-loading oil terminal at the Phillips 66 Santa Maria Refinery, the issue will come before the San Luis Obispo Planning Commission for hearings on February 4 and 5. Phillips frames this issue on the word “viability,” which means that California crude is diminishing and thus jobs would be lost if the refinery were to close. But reading the Final Environmental Impact Report, it clearly states that there are sufficient local resources for crude and that if the project were not approved, the refinery would not close. So what is their rationale? Simply to avail themselves of “advantaged crude,” which is shorthand for the cheaper and most toxic of tar sands crude from Alberta, Canada, at the expense to health and public safety of communities along the mainline. There are five Class 1 impacts that relate to air quality that cannot be mitigated both within the refinery and along Union Pacific’s tracks. Operational activities associated with the Rail Spur Project at the Refinery would generate criteria pollutant emissions that exceed SLOCAPCD (San Luis Obispo County Air Pollution Control District) thresholds. Operational activities of trains along the mainline rail route outside of SLO County associated with the Rail Spur Project would generate criteria pollutant emissions that exceed thresholds. Operational activities at the Refinery associated with the Rail Spur Project would generate toxic emissions that exceed SLOCAPCD thresholds. 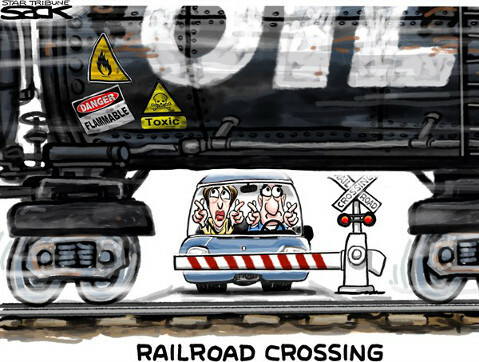 Operational activities of trains along the mainline rail route associated with the Rail Spur Project would generate toxic emissions that exceed thresholds. Operational activities associated with the Rail Spur Project would generate GHG (greenhouse gas) emissions that exceed SLOCAPCD thresholds. There is no compelling benefit to the residents in towns north and south of the Santa Maria Refinery, which is located in Nipomo, when balanced against the risk that 400 tanker cars per week carrying highly volatile crude will be transported up and down the coast, past schools, hospitals and businesses, with the potential of a derailment and/or explosion. No one is saying close the refinery. Let them do business as they have in the past with a passive pipeline. In fact, there are two more pipelines scheduled to come on stream that will pretty much accommodate Phillips 66’s needs. Phillips 66 will admit that we are awash in crude from the Coastal Islands; they simply don’t want to pay the prevailing market costs. So they use the code words that they need to remain viable. That’s nonsense. It’s pure rapacious greed. Make your voice heard. Plan on attending the Planning Commission hearing. You can stop this project in its tracks.